Henri Cartier-Bresson attended the famous Lycee Condorcet in Paris, Ile-de-France. In 1927, driven by his interest in modern art, he enrolled in the Lhote Academy, a painting studio in Paris owned by Cubist painter Andre Lhote, who was one of the biggest influences on his artistic career. Fascinated by the Surrealist movement, Cartier-Bresson started experimenting with the art of photography in the early 1930s. He was inspired by Three Boys at Lake Tanganyika, a 1930 photograph taken by Martin Munkacsi, a Hungarian photojournalist. Henri Cartier-Bresson decided to take his Leica camera with 50 mm lens and go into the street to capture “eternity in an instant,” as he called it. Captivated by the “little human detail” in the real world, in a continuous movement and metamorphosis, Cartier-Bresson photographed in many cities in Europe, including Brussels, Budapest, Berlin, Madrid and Prague. Mentored by the renowned Hungarian photographer Robert Capa, whom he met in the early 1930s, Cartier-Bresson switched from surrealist photography to photojournalism. His first photojournalist pictures, which captured the coronation of King George VI, were published in 1937 (under the name Cartier) in the French weekly magazine Regards. Surprisingly, the photos did not capture the British monarch. Instead, they vividly and realistically presented his subjects which were lining the London streets to applaud the new king. Photojournalism enabled him to further develop his artistic vision through the means of photography and to capture the actual unique moments offered by life in its purest and unchanged form. Cartier-Bresson also became the very first Western photographer to shoot freely in the post-war Soviet Union. Using almost exclusively Leica 35 mm cameras equipped with 50 mm lenses or sometimes a wide-angle, Cartier-Bresson was less interested in the technical aspects of photography and more focused on great composition, creativity, and expression of his photos. He used black tape to wrap the chrome body of his Leica miniature-format camera in order to make it less blatant and to capture with “the hawk’s eye” and “the velvet hands” the reality of events and the ordinary daily life. His “only superstition” referred to the fact that he tested new camera lenses by photographing ducks in city parks. 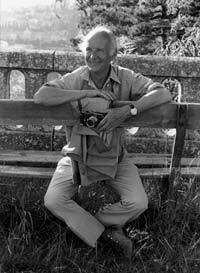 Cartier-Bresson was the recipient of the prestigious Hasselblad Award in 1982 for his major achievements in photography. He is also famous for working exclusively in black-and-white and for photographing without a flash because he considered it impolite to use a flash. The term “decisive moment,” coined in his book with the same name, is synonymous with his brilliant career in photography. Cartier-Bresson has paved the way for generations of photographers across the globe. The book The Decisive Moment, which was published in 1952, contains 126 photos taken by the French photographer all over the world. Henri Cartier-Bresson retired in the early 1970s from photography to focus on painting and drawing. He did not enjoy being photographed himself and he was a humble and modest person in the world of art. He died on August 3, 2004, at the age of 95, in Montjustin, France. He was survived by his daughter, Melanie Cartier-Bresson, and his second wife, Martine Franck, a famous Belgian portrait and documentary photographer. Created in 2003, the Henri Cartier-Bresson Foundation aims at preserving the legacy of the father of modern photojournalism.